PanoPerfect app is the winner of Winner Apple Design Award 2014. Created by two young Californian students, this app lets you share your panoramic photos on your iPhone with an emphasis on aesthetics. This side design and fluidity of use is also what attracted the Apple selection committee. PanoPerfect functions as a social network. Your panoramic photo, as soon as it is posted, returns to the vertical current timeliness flow and joined all the other posts. It then commented, liked and bookmarking by other users. From the moment you can create a profile, add your biography, your username, the discussion begins by sharing your favorite landscapes. 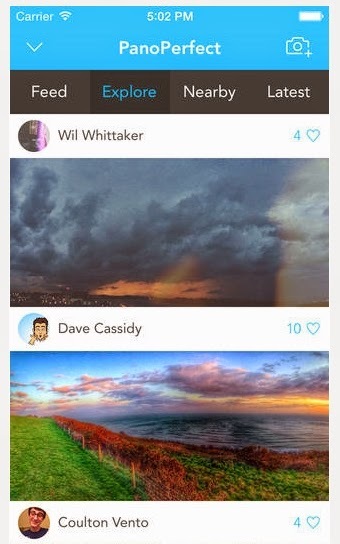 They are particularly highlighted because you have 17 different filters to improve the shot. The annual competition since 1996 presents awards for Best Practices in several categories. It rewards independent developers during the Worldwide Developers Conference which is held in California. Then the best achievements are supported by apple.